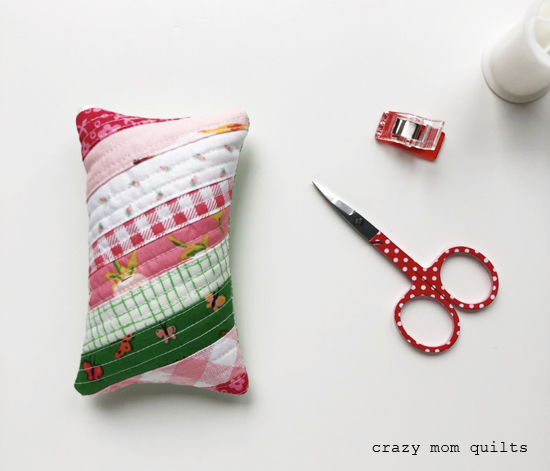 I made a few pincushions from scraps to get started, because pincushions are ALWAYS a good idea! They each measure about 3" x 5" and are filled with crushed walnut shells. Then I moved on to some pot holders. They finish about 8 1/4" square. (I use Insulbrite for the inside, so they are heat resistant.) I also used bias binding, since the corners are rounded. It takes a bit longer to make them this way, but I really like the look! AND...I started another quilt! I'm using mostly stash mixed with a few scraps. I thought I would try something new. Hahaha! It's definitely still a work in progress, but I'm enjoying the process. I'm still trying to get the color balance right, but maybe I'll get there by the time I make all 40 blocks. That's the hope, anyway! I love the colors and prints you are using in the new project. Have fun at glamp stitch-a-lot! so many colorful projects! and true, it IS difficult not to start new ones! Love your bias projects! (As well as everything else you do!) When you use Insulbrite in potholders, do you also use batting? Thanks! LOVE the colors in the new quilt. LOVE them. I love your scraps together!!! Very nice. I really like the string quilt! Love all these projects... would be interested in your thoughts on what would make a block have the right colour balance? What is your goal for the colours in the new string quilt? Pretty new quilt going! Kind of a chambray look, would you say? 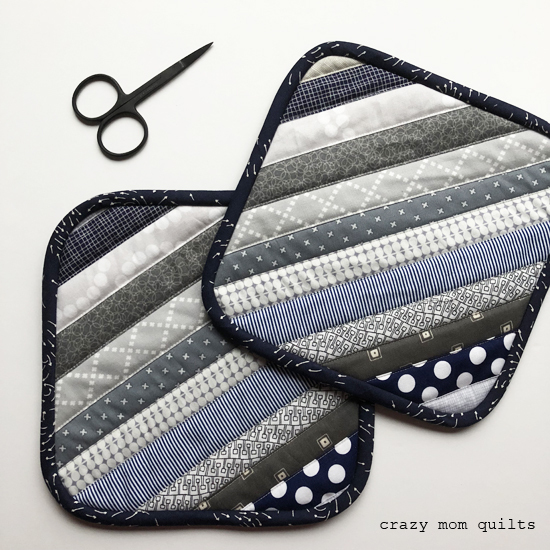 I love all of these projects, especially your bias rectangle blocks! I so wish I could take a class from you! I love all of these projects! I now what to make a bias rectangle block quilt! Again, I love everything! you do! Those hot pads would match my remodeled kitchen! 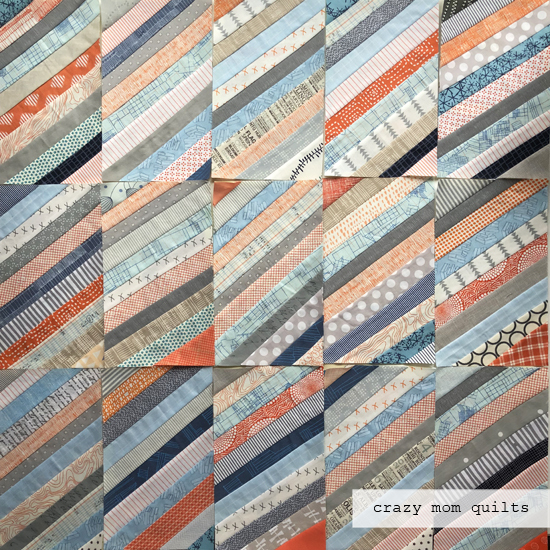 Great colors in those quilt blocks! So many fun string projects!!! I hope you have a great time at your class!! And I am loving the mixtures of oranges, blues, and greys!!! 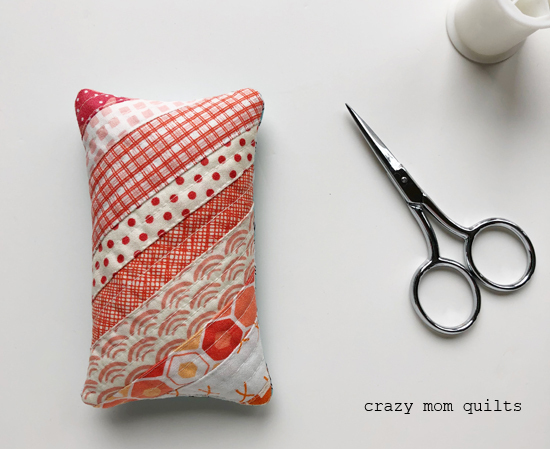 I have to admit, I LOVE LOVE LOVE the string quilt blocks in this style with the colors you have chosen here! I cannot wait to see the finished quilt!! I'm a big fan of your designs, think I'll try a few of these. I have a big bin of selvages which would work too? maybe? I really like your color choices in the new quilt, might try copying. Strings! What fun! Yesterday I committed to a group string project when I return to the island in the spring. I’ll be the 'teacher', so it will be fun. We’re hoping to get a couple of community quilts from our efforts. Lovely quilt. To me it has a vintage feel. Can't wait to see it finished. OMG!!!! What is it about those pot holders?? I LOVE THEM!! !